Infinity Call Tracking is a Cloud based call tracking service with integrated visitor tracking capabilities. With Infinity you can track calls from your website and know exactly which marketing activity brought those visitors to your site. Work for Infinity Call Tracking? Learning about Infinity Call Tracking? "Great Phone Tracking Service - Excellent Support"
We have been using Infinity call tracking for several years and we are very happy with the service. It allows us to track our numbers and understand our customers journey from lead to the sale. Customer service is great! Had an issue today where we needed to turn a dynamic number into a static diverted number and Sam in the support team had it done in under 10 minutes! Its great to see a company that supports their clients by support ticket and then follows up with a phone call. Everything has been running smoothly for several years now. No complaints. 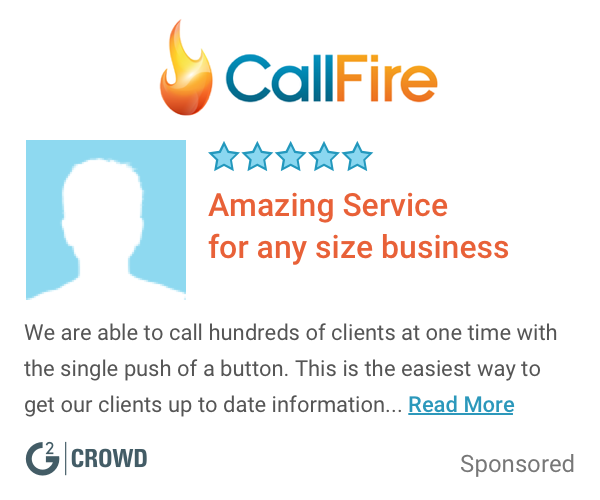 Tracking calls allows you to see keyword to call through rate on adwords. You can the spend money on call converting keywords. In a B2B industry the larger volume orders come through the phone. Adword tracking, customer pipeline. It allows us to track keywords that come through as calls and clicks and in turn track the conversion. "Extremely powerful tool delivered with exceptional service "
I have acquired Infinity at 2 different companies now and have been very impressed with how smoothly and professionally it has been implemented and set up. It just works and works really well. The integration with other platforms is great. Mostly though, it is a game changer in how total website revenue can be measured and optimised. Also Infinity have only ever been flexible and willing to adapt and customise things to my specific requirements. In hospitality it means we can move from focusing predominantly on direct room bookings to also optimising the total revenue generated by the website, for example events/weddings, restaurant bookings, etc. This completely transforms how we optimise digital media and the total value that the website can generate. The great Infinity team that works with us, no question is to much. A big thank you to Chloe Hackett in support and Lisa Nethercott our CSM, as always you have been brilliant. Having to flip between the new hub and the portal. We have been working with Infinity since 2015 and have installed Infinity across a number of countries. Infinity have allowed us to see more in depth data on all our calls than we have ever had in the past and this is vital for our success. "Great service and great tracking tool"
The tracking enables us to make business decisions with detailed information about our best advertising stream. If we're unsure about anything the customer service is great and very knowledgeable. Usually resolved in the first contact and if not, very quick service response. Can probably do more than we use it for and difficult to know what you can do unless you ask. Only stores some of the information for up to a month and on occasions would be helpful to go back further. We track where clients are looking before they contact us and also how they find us and the result of calls. So we know what is working best. Infinity works quite well in tracking the different sources of all campaigns. Their customer service team isn't particularly helpful. In a recent issue i had, they just kept emailing me asking if i'd fixed the problem - completely ignoring my questions each time. The software itself is quite good though. Pulling in adwords campaign data requires downloading and uploading a file. We use it to track just how many of our adverts are performing - better still, we use it to tell exactly which campaign, ad group and even keyword is working. It is invaluable to us for this, as if we just listened to google adwords data, we'd be taking a very different (probably incorrect) approach. "Trustworthy service with great customer support"
Infinity offer a great support system to customers. Service is always polite, helpful and speedy. A range of clear display graphs helps you chart growth and view useful details. Would be great to receive automated reports to our inbox to track growth more easily and remain up-to-date with ongoing progress. It has allowed us to to track our referrals, see which areas we are excelling in and where we need to focus on. We have been able to create a range of bespoke numbers, allowing our business to grow and allowing us to carefully track this growth. "Excellent service from the support team"
I like that you know what you're getting with the Infinity support team. Not only will you always get a prompt response, but they are always happy to help, and most importantly they are knowledgeable in their field and always able to help with what the query is, no matter how technical. There isn't anything that I dislike about the service offered by the Infinity support team. The ability for our clients to track where calls are originating from, and feeding goal data into their CRM. "Infinity's SFDC app setup & experience is great!" Their SFDC app for reps taking inbound calls is awesome - simple and efficient for a repeatable motion. Their ability to support and conquer technical business challenges has been fantastic. Their UI has gotten a major overhaul, so looking for some improvements there. Also, they're getting into talk to text, conversational analytics, etc - wish we already had some of that up and running! great SFDC app for sales, and seem to be heavily investing in R&D (conversational analytics, new UI/platform). "Quick and helpful service "
Indy has been a real support to getting us running over the last few weeks. We really value the product and we are thrilled that the support offered is just as impressive. We are not using the platform to its full potential so this requires staff training, other than that we are satisfied with the features and data. Lead sources and where operational improvements are needed. I love that it integrates easily with all platforms that we are using. We can pull in data from multiple sources and see it all in one place. I also like that you can see data at the Campaign, Ad Group and Keyword level. With a simple excel download, you can pivot all the data that you need. This is a british company, therefore the time difference when you need support is a bit tricky. Seeing keyword level data to better optimize campaigns, as well as comparing paid vs SEO vs social performance. "Fantastic analytics and support "
The support aspect, fairly quick, weekly sync ups to discuss numbers and traction rates, the customer success we have with Danielle as point of contact couldn't be any better. n/a - I don;t have anything that I dislike, everything ticks all the boxes required. Tracking strategic behaviors of prospects on our website before first point of call into our business. Receive detailed answers to queries, prompt response. Would like to see AMP page support, which would assist us. Have been trying to rationalise our google paid search, infinity has helped by showing us what converts up, and what to invest the revenue in. "I have had to contact the Infinity Support Team on 3 separate occasions over the past few days. Every time, I've contacted them, they are extremely polite and responsive and dealt with my query quickly. Chloe Hackett was fantastic - Very impressed. Keep up the good work! " Sometimes you can't always speak to the same person with the support desk - but all agents are more than happy to help. * We monitor all Infinity Call Tracking reviews to prevent fraudulent reviews and keep review quality high. We do not post reviews by company employees or direct competitors. Validated reviews require the user to submit a screenshot of the product containing their user ID, in order to verify a user is an actual user of the product. Hi there! Are you looking to implement a solution like Infinity Call Tracking?